These blustery, frigid winter days make me think forward to spring, warmer days, fresh air, and new life! I do love winter, and this was not always true of me. Embracing winter sports was key to me finding joy in winter. I can now say I own skis, and I can snowplow down the hill with the best of them (The best of the 3-year-olds, I mean. No, just kidding, they are better than I am!) In all seriousness, I do enjoy downhill skiing, and it makes winter so much more enjoyable. 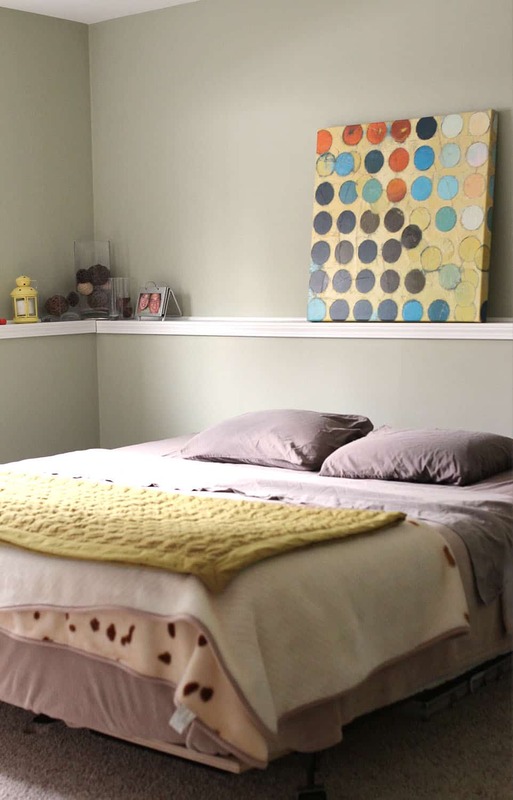 On to my topic today, I think our guest bedroom needs a little freshening up! If you’ve looked through my home tour, you will see several rooms that have never had new pictures shared since we purchased the house. Since I’ve neglected to share the guest room, I’ll show you today what we did when we first moved in, and my plans to give it a freshening up now. Wow, it’s so much blue-er than I remember! We painted the walls, painted the trim, painted the ceiling, added a shelf to the closet, and laid new carpet. We set down furniture we already had and knick-knacks/books we didn’t know what to do with and…voila! Forgive the less wide angle shots, I don’t have the lens I took the original photos with anymore. The walls are a sage green, white trim, and beige-speckled carpet. Even with editing, these photos are reading dark. The walls are lighter than the picture shows and definitely green. These almost look dark beige on my computer. There is one, off-centered, window in the room (why are windows ALWAYS off-center??). It has a cellular shade, but nothing else pretty to dress up the window. It’s a pretty blank slate. 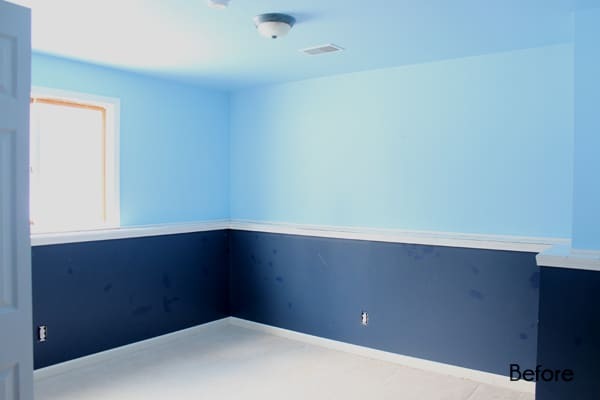 The wall color is fairly neutral. 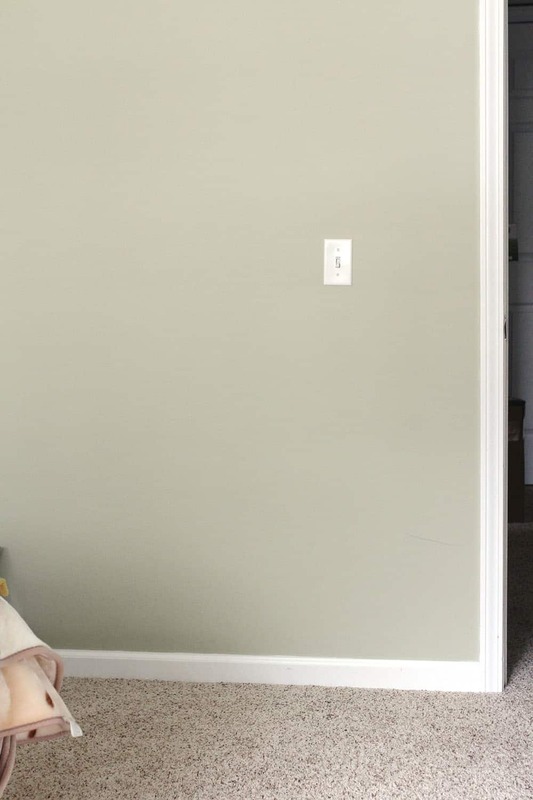 I wouldn’t mind painting the walls, but I’m trying to make this a $0 refresh, so new paint is not in the plans! DIY Art – I’m thinking a “Be Our Guest” painting like this. I’ll be painting over the Ikea dot canvas that is resting on the ledge above the bed currently. Wifi Password Display – I’ll make my own, but something similar to this. Dresser – I’m going to move the dresser from the old nursery/current playroom down to this room. It is sitting empty up in the playroom, and I still really like that old dresser! Window Covering – I’m really up in the air on this one. The first thought I had was a cornice box. The drawbacks I see of this are (1) I’d have to buy wood to make it and (2) it wouldn’t flow with any other room in the house. Does it need to? Thoughts? The other thought is curtains, which I would sew myself. I love long curtains. However, this is a daylight basement room. It has that half-wall/ledge thing. I think long curtains would look weird, and I think short ones look odd too. I love curtains, but I’m not sure this is the right room for them. Fabric covered cornice box? I do like this one and this one. I really like the nailhead trim on the second one, but I don’t have those on hand. Barn door shutters? I’ve heard the hardware is expensive, and I think it’s a bit rustic for my tastes. I find this idea GENIUS. The long curtains plus precisely hung art perfectly trick the eye. Not the right solution for this room, but I love how that designer thought outside the box! Any other ideas I haven’t thought of? 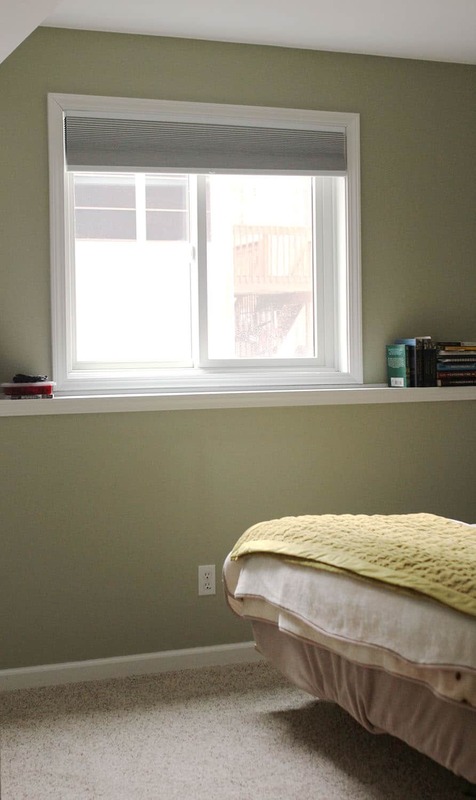 What have you use or seen in a daylight basement window? 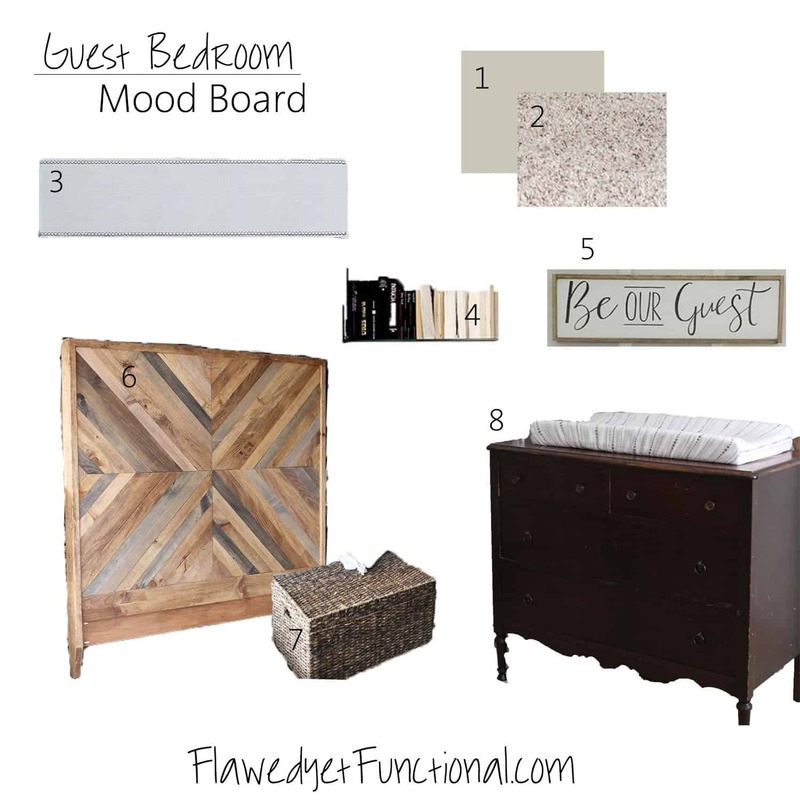 Headboard – I’d like to build a headboard for the guest bed using only scrap we have. Dan’s not 100% sure we can, so we may have to spend money on wood for this one, but I think a headboard will go a long way to making this room look welcoming and finished. Bedside Tables – The goal is to get one on either side of the bed. I’m planning to shop the house on this one and be creative! They will be small ones though because the bed in this room is king-size, and the room is not really king-sized. You do what you can with what you have, right?? 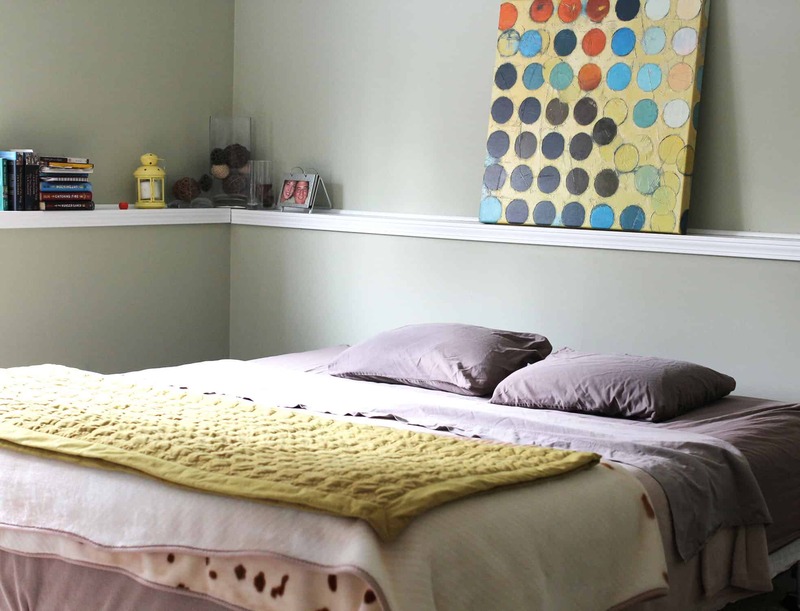 If you’d like to see all my collected ideas, check out my Home | Guest Room board on Pinterest. While you’re there, follow me for more house and health inspiration! I’m so excited to tackle a home project again! It feels like it’s been ages! I’ll be updating you as I go. Feel free to give your input! I could really use suggestions on the window covering, bedside tables, and even how to use or not use that half wall! I like the fabric overestimate cornice box!!! It makes the room cozy and adds texture! Me too! That’s definitely the way I’m leaning unless I find another great idea!